MCSquared, which brought a pair of indigenous Ecuadorians to the protest, told reporters at the time that the Republic of Ecuador was a client. It now says it has no relationship with that government. Asked about the protests, Karen Hinton, the PR executive representing plaintiffs in the Chevron suit, told Bloomberg reporter Paul Barrett to "call MCSquared. They handled." Hinton told Barrett that the government of Ecuador was a client of MCSquared. A MCSquared employee told PR Week the same thing. That raises thorny legal questions for the firm, experts say, since anyone conducting public relations in the United States on behalf of a foreign government must disclose that fact to the Department of Justice. MCSquared has failed to register. The Foreign Agent Registration Act (FARA) requires such disclosures of "any person who engages directly or indirectly in the publication or dissemination of oral, visual, graphic, written, or pictorial information or matter of any kind" on behalf of a foreign government or representative thereof. "Any person who engages directly or indirectly in informing, advising, or in any way representing a principal in any public relations matter pertaining to political or public interests, policies, or relations of such principal" must also disclose that activity. Asked about that lack of disclosure, MCSquared spokeswoman Maria Garay said that the firm "currently [does not] have an engagement with the government of Ecuador." Garay did not respond to follow-up questions about whether the government was at any point a MCSquared client, and, if so, what the dates of that arrangement were. The protest, which MCSquare denies directly organizing, was part of a decades-long legal, political, and public relations battle between environmentalist plaintiffs, supported by the Ecuadorian government, and Chevron, which acquired Texaco and its legal liabilities in Ecuador, in 2001. The company currently has no assets in Ecuador. Chevron has won a string of legal victories in its effort to prevent the enforcement of a multi-billion-dollar judgment against it by the seizure of assets in Argentina, Brazil, and Canada. A New York court recently ruled that plaintiffs in the suit were engaged in an illegal conspiracy to achieve that judgment, involving allegations of bribery and fraudulent legal practices. MCSquared dubbed Chevron’s legal claims against those plaintiffs a "retaliation campaign" in a press release dated May 26. 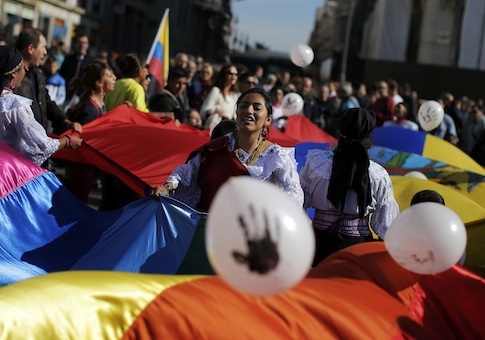 It touted protests at the shareholders meeting and announced that a pair of indigenous Ecuadorians "who represent the affected communities" would be in attendance. One of those Ecuadorians, Humberto Piaguaje, "helped lead the sign-waving, slogan-chanting cohort," Bloomberg BusinessWeek reported. Bloomberg also revealed that a number of the protesters at the shareholders meeting were paid to attend, reportedly receiving $85 apiece from a Los Angeles production company to serve as "extras/background people" during the protest. In September, Richmond, Calif., mayor Gayle McLaughlin traveled to Ecquador to tour areas of the Amazon allegedly contaminated by Texaco. According to an amended financial disclosure statement filed by McLaughlin in May, she was paid $4,498.94 by "Presidencia Republica del Ecuador (via MCSquared PR, Inc.)" for the trip. In addition to the disclosure of public relations work, FARA requires that entities lobbying or conducting policy advocacy on behalf of a foreign government disclose that fact. FARA became law in 1938 as a means to blunt perceived Nazi efforts to dissuade the American public from supporting military intervention in Europe. The law does not restrict advocacy on behalf of foreign principles, but merely requires that it be labeled as such. One attorney who deals with FARA compliance told the Washington Free Beacon that MCSquared’s work at Chevron’s shareholders meeting is "the type of work DOJ would be interested in." Garay insisted that MCSquared's work at the meeting was undertaken pro bono on behalf of the indigenous Ecuadorians who attended. However, the FARA attorney, who asked to remain anonymous, said that parallels between the interests of a foreign principal and activities supposedly undertaken on behalf of a separate client could still raise red flags. "The bigger concern is if an entity is doing perhaps paid work on behalf of a foreign principal, but then claiming that they’re doing similar work that they’re not being paid for on behalf of this pro bono client, DOJ might be inclined to ask why they’re engaged in this activity for free," the attorney said. MCSquared has publicized anti-Chevron events concerning environmental damage in Ecuador as early as October of last year, a month after the firm paid for McLaughlin’s trip to the country. Its employees also have direct ties to the Ecuadorian government. Cynthia Zapata Solis, who is listed as a contact on MCSquared’s website, has worked in various capacities for that government since at least 2008, when she took a job with the Ministry of the Environment, according to cached search results for her now-deleted LinkedIn profile. Jean Paul Borja, the MCSquared employee who confirmed to PR Week that the government of Ecuador was a client, has frequently written for Ecuadorian state-run media outlet, El Ciudadano, or The Citizen. One issue gave his MCSquared email address as his contact information. Borja’s byline appeared in El Ciudadano as late as April of this year, when he wrote an article headlined, "Celebrities and experts support Ecuador in its struggle against Chevron." The article touted McLaughlin’s MCSquared-financed junket to Ecuador. El Ciudadano is run by the country’s National Communications Secretariat, which has been criticized by Ecuadorian dissidents as one of the Correa administration’s foremost means of regulating and censoring opposition voices in the country’s news media. A Ciudadano writer has previously accused the Free Beacon of "attempting to misinform the international community about the [Chevron] trial."